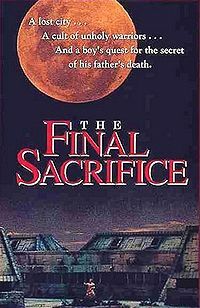 (AKA The Final Sacrifice). 1990, Starring Christian Malcom, Bruce J Mitchell, Shane Marceau, Ron Anderson, Bharaba Egan. Directed by Tjardus Griedanus. Despite it's flaws, Quest for the Lost City is a silly little independent picture which is very characteristic of Canuxploitation. This is the story of Troy, a kid who inadvertently stumbles on an alien cult and an underground civilization in the backwoods of Alberta. One day while rooting through his deceased father's papers, Troy discovers some maps and letters about a strange cult. As if the cult had some knowledge of this, Troy's house is suddenly surrounded by thugs in red cloth masks. Their black trenchcoated leader is a man named Satoris, who cuts through Troy's front door with a chainsaw. Troy escapes on his bike, and pursued by more gun-wielding cultists, he hides in the back of a rusted old truck which is driven by our hero, Mr Zap Rowsdower. And now a word about Zap Rowsdower. Zap is so Canadian that he is almost a parody of Canadians. He is an unshaven beefy guy in an old jean jacket. He has a blond mullet, a bushy mustache and drinks from a flask in his pocket. He is unemployed, and owns a rusted truck with a picture of his girlfriend attached to the dashboard with a clothes pin. And what is Zap Rowsdower's first heroic act? He dumps some empties from the back of his truck under the car of the cult members, running them off the road. Now that's an action hero Canadian style! After driving into the woods to escape the cult, Rowsdower's truck breaks down. Zap builds a campfire and bonds with Troy, telling him a little about the cult's plan to take over the world. Then Rowsdower drinks some beer and Troy sleeps. 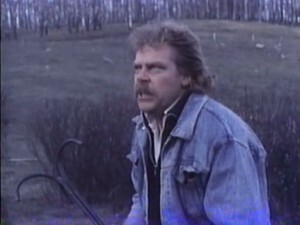 The next morning, Troy goes off and Rowsdower gets kidnapped by the cult. He is brought before Satoris, who rips Zap's jean jacket to reveal the cult's emblem branded on his shoulder. Zap escapes, and is chased by some hooded cult members with guns. He snaps the neck of one, and shoots a couple more. He looks like he wishes he was back at the campfire with his beer. Meanwhile, Troy stumbles on a cave opening where he finds a secret message he transcribes into his notebook. Meeting up with Rowsdower, they hide in a nearby log cabin. Their reunion is short-lived, as they are soon greeted by the owner of the cabin, a grizzled man who looks and talks like Red Green. He is Pipper, a friend of Troy's Dad. Pipper tells them everything he knows about the cult-- they are trying to take over the world, and believe themselves to be part of some sort of master race. Rowsdower also explains to Troy how he was part of the cult, but was kicked out by Satoris. Then there's something mentioned about the "lost civilization of Ziox," which is buried under the ground. Supposedly it will rise if some idol collapses, but it's all very confusing. We also learn that Satoris' cult worships Ziox, and there are sacrifices. FINAL sacrifices. Pipper solves the map and the whereabouts of the idol with the message Troy got from the cave, and they vow to destroy the cult after a good night's sleep. The next day, Troy is kidnapped by the cult. Rowsdower arrives at the site of the idol, and finds Troy tied to a post. Rowsdower cuts him loose and attacks Sartoris with a flaming piece of wood. Sartoris takes the torch away from him, and Rowsdower grabs a grappling hook that is luckily laying in the grass in the middle of the woods. And now it's Zap vs. Satoris! 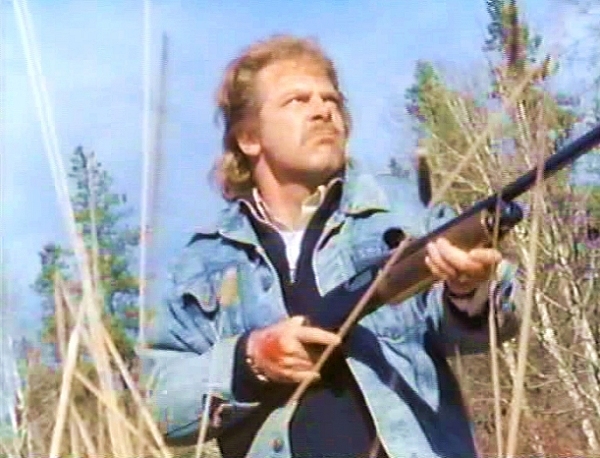 Sartoris is about to kill Rowsdower when Troy shoots him with a gun, which was apparently beside the grappling hook in the random weapon cache Alberta forests are so famous for. The torch falls and sets fire to the ground. Inexplicably, this causes the idol to fall, and the lost city of Ziox to rise. And it does rise, in a special effect stolen from another movie, into the sky never to be seen again. The cult disbands and takes off their hoods, and Rowsdower examines his arm to reveal that his brand has magically disappeared! Thanks to Mystery Science Theater 3000, this otherwise unknown film emerged from obscurity when it was shown under the title Final Sacrifice. 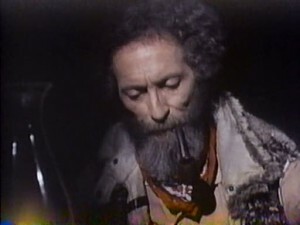 Although the show ran a number of bad Canadian films including Overdrawn at the Memory Bank, City on Fire and Zombie Nightmare, this particular movie has remained a favourite for fans of the show. The biggest problem this movie has is the soundtrack. The music is badly recorded and often has little to do with the action on screen. Worse, it never stops—almost every scene is underscored with annoying synthesizer beats. Substandard camera work and bad editing also sap the film of any atmosphere or tension. This was filmed in a small town in Alberta. The town looks a little worse for wear, but if you didn't grow up in a town like the one in the film, you probably lived near one. This was director Griedanus' only feature, as well as Bruce "Rowsdower" Mitchell's only starring role.